• Novelty Trillion Dollar coin. • Each Coin is Lavished in Platinum. Buy one and get one FREE! The trillion dollar coin is a concept which emerged during the United Sates debt ceiling crisis in 2011, as a proposed way to bypass any necessity for the US Congress to raise the country’s borrowing limit, through the minting of very high value platinum coins. The concept was ultimately rejected by the Federal Reserve and the U.S. Mint never produced the coin. The Merrick Mint in a private minting created this Limited Edition non-monetary “One Trillion Dollar Proof Coin”. This novelty coin is platinum plated and boasts superb detail making it both a great conversation piece and a collectible heirloom for generations to come. 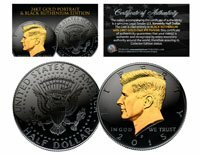 Each coin comes in a coin capsule with certificate of authenticity.